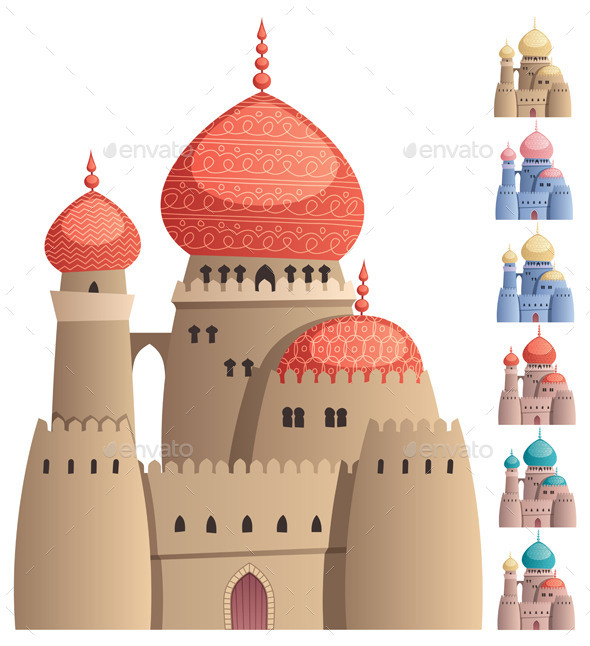 Cartoon Arabian castle on white background in 7 color versions. No transparency used. Basic (linear) gradients. AI, CDR, EPS, JPEG and PSD files. Superheroine Flying Envelope; Superheroine Flying E-Mail; Superheroine Flying 2; Superheroine Presenting; Superhero Flying Envelope; Superhero Flying 4; Spartan 2. Keywords: 1001 nights, arabian, arabian nights, arabic, architecture, building, cartoon, castle, clip art, dark ages, dome, fable, fairy, fairy tale, fantasy, fort, gate, history, isolated, medieval, middle ages, middle east, minaret, muslim, One Thousand and One Nights, oriental, palace, stronghold, tale, tower.